RIM has been doing its part to keep the excitement and the anticipation levels high for the upcoming release of BlackBerry 10 next month. We have seen a lot of companies lining up to bring their applications to the new platform. Okay, so you see “at the moment” and think, “Well, that means they might support it later!” We do not want to rob you of that ray of hope, so hold on to it if you want to. Alas, as it stands now, at best case, WhatsApp will not be available when BlackBerry 10 launches. However, it is certainly reasonable to think that WhatsApp would develop their app for BlackBerry 10 if it proves to be the success that RIM says it will be. 'IF' I had a dollar for everytime I heard that about BB 10, I'd have more money than Warren Buffet. I know ... But that's the question now ... Unless RIM pays for the support, or give some great incentives (They might offer to pay 50 ¢ for each BB10 to use WhatsApp in the first year, for example), no one will invest in something almost dead. But if in spite of everything, the BB10 prove promising, then RIM will only need to sit and wait, because all developers will knock on the door sooner or later. However, I find it hard that BB10 will be successful without a good base with critical applications. 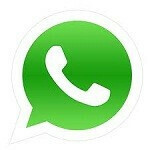 And WhatsApp is a great name for a large number of Smartphone users around the world. After about a month of whatsapp being pulled from the windows phone 8 store, it reemerged today. It was said to bring faster application performance (up to 6x faster), an enormous amount of bug fixes (it had quite a few) and support for new emojis. The new version should be better right? WRONG. The app is running slower, if it even runs at all. The connection constantly times out and disconnects frequently. Forget new emojis, the option to add emojis was completely removed, and it came with a new batch of bugs to go along with the old one. Mind you, it was gone to be remodeled for a month. Whatsapp is trash. My windows store is trash. Back to my Note 2 and android. -Disgusted windows phone user. It works flawlessly on Android, at least on my last two phones. But it's not available on iOS. So I would think they would show WP8 and BB10 some serious love. I wonder what their game plan is because the limited support for other devices is forcing many people to Kik, which I'm starting to like much better now with the new update. I though it was available in Sh€€p Land? Not that I can see. And every time I've asked friends with iPhones to download it, they would say "I cant find it. Just use iMessage". Lol...ahhh that's funny! Look into things for yourself and dont rely on others. Its a cross-platform messenger and is available for ios. Well, after checking my iPad for the third time today, it still isn't coming up. I have and use the app. It the others that can't seem to find it. It is available on iOS. It is for iPhone only. It does not support iPad, and iPod touch. Checked again... Not there. This time I checked both my iPad and computer... It simply ain't there. Oh wait, I think you might have to be iJailbroken. You are incorrect because it's installed on my Gorgeous Galaxy Note II 4G LTE ☆ with Multi Windows; and, I had it installed on my DROID RAZR MAXX!! So why am i incorrect? You are naming 2 phones? I'm talking about the tablets that can't use whatsapp cause they don't have a phonenumber im not sure about the tablets with 3g. And I'm glad you like your note2. Well, it seems your the a$$ in assumption because like most of the people here that like to attack people before attempting to really THINK! Not I just did a basic web search of the app. That web search gave me a link to Whatsapp in the iTunes app store. I clicked on the link which attempted to bring to location in which I could download the app, when suddening a pop up message appeared... "not available in the US App Store". Your talking to a technician ma'am, so I tend to think a little harder a deep than the average fanboy like yourself. And you were to deep in your fanboy rage to realize, I'm not the one with the problem...it was people I KNEW...WITH IPHONES... that couldn't find the app. So we were ALL right in one way or another. But you chose to be the one to get his a$$ handed to him for being disrespectful. Class dismissed. Much respect to all of you who disagree with me but still conducted yourselves like ladies and gentelmen. Wish we had more like you all here! Sorry for not proof reading everyone. Will do better. Oh no, he doesn't believe me. What ever shall I do? Maybe he's right, maybe EVERYONE is lying, including itunes itself. And maybe its only blocked on my imagination, and that's why all my imaginary friends can't find it either. Nah. Face it, you're a jerk and everyone knows it. Hopefully, in our next exchange you will be a little friendlier, even if you think I'm wrong. (Obviously you were wrong in this case but, I won't rub it in). Until I got to your second-to-last question I was going to write you to say, "sorry, it's your phone;" glad you figured it out on your own. Welcome back to the Wonderful World of Galaxy Note II with S-Pen and Multi Windows; goodbye MicroPoop. i have whatsapp on my lumia 920. i had the version before they pulled it from the store to make it wp8 compatible. the new version is definitely faster and runs smoother. i can tell they made the necessary code changes for it to work smoother on wp8. you represent the minority that say it doesnt work. Dude, you DO realize that the Whatsapp for WP8 now is an older version right? This version all WP8 users are currently using is older than the one for WP7.5. My guess is, this is just to pacify the people who REALLY require Whatsapp to be on their device. In the meantime, the developers at Whatsapp could be working on the REAL new version that you mentioned. You DO realize youre misinformed and this is an "optimized" version for windows phone 8. Version 2.8.10. And you REALLY should look into things.